I had a lovely weekend of hanging with friends, relaxing and cooking. 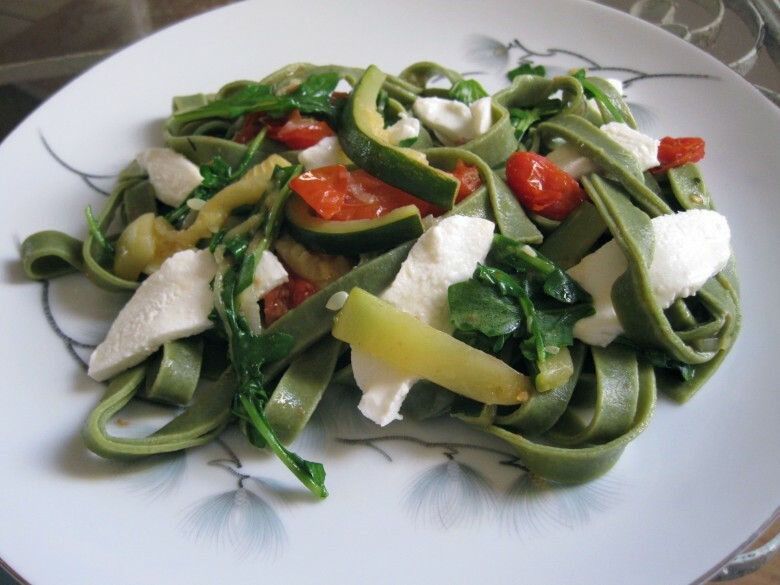 After a quick breakfast and a day full of running around, Sunday’s mid-day meal was an light, fresh and early dinner – spinach fettuccine with fresh mozzarella, zucchini, roasted grape tomatoes and arugula. For ingredients: Spinach fettuccine, baby arugula, zucchini cut into sticks, small sliced onion, fresh mozzarella, and 3/4 package of grape tomatoes (that’s all I had left in the house.. they were getting a little wrinkled, and while you may not find them too appealing to pop in your mouth anymore, it’s a good time to rescue them into a sauce). 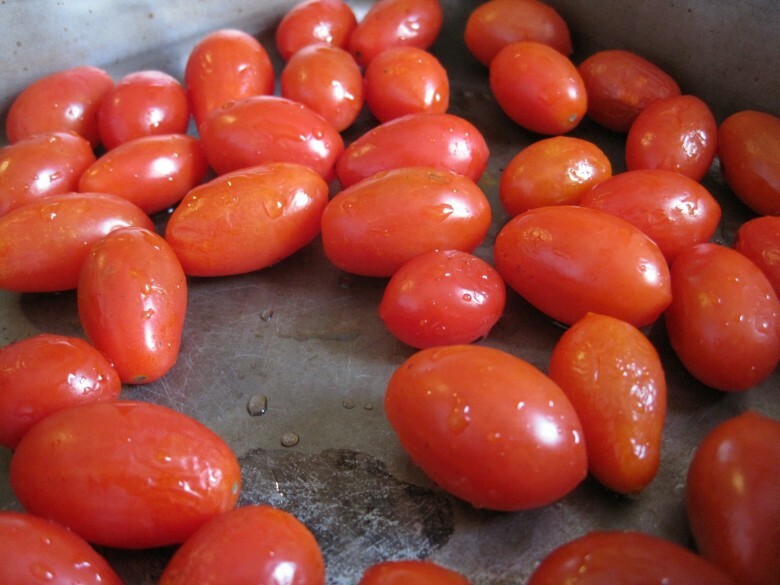 Start by placing the tomatoes into a baking dish, toss with a little olive oil and put under the broiler for about 8 minutes, until they begin to pop open at the seams. Start boiling water for the pasta. It can get going at the same time you whip up the sauce. This is a quick meal!! Meanwhile, on the stove, heat some olive oil. Toss in the onions, zucchini and some seasoning (red pepper flakes and some combination of thyme, oregano, basil or rosemary). Sauté until the onions are translucent and then add the roasted tomatoes, as well as any oil and juices that were left over in the roasting pan. Stir together over low heat for a minute and then add a few spoonfuls of starchy water from the pasta to the pan, then cover tightly for a minute. Finish cooking the pasta. When straining, reserve about 1/4 cup of the cooking water. Put the pasta back in the pot. Take the lid off the sauce and turn off the heat. 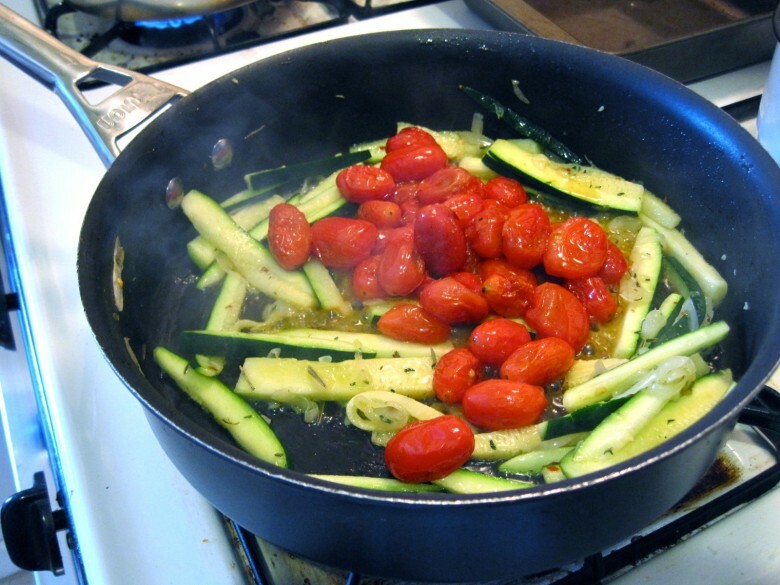 With your cooking spoon, gently smash any tomatoes that have not popped open and the pour the sauce and the 1/4 cup cooking liquid over the pasta, toss well and then serve. Sprinkle the dish with a few thin slices of fresh mozzarella and eat up!! 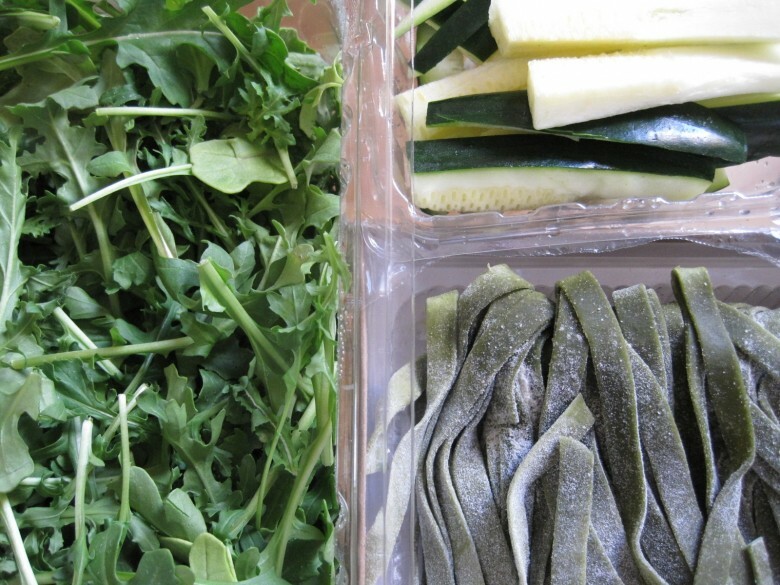 April 19, 2011 | Filed under dinner, lunch, vegetarian and tagged with arugula, dinner, fresh, Italian, light, pasta, tomatoes, vegetarian, zucchini.